After the parties are divorced, issues may arise thereafter which require a modification of alimony and/or child support. Under New Jersey law, alimony is subject to modification based on a significant change in circumstances befalling either party. For example, say at the time of divorce the husband is earning $100,000.00 per year and the wife is earning $40,000.00 per year. Let us assume further that alimony was set such that husband will pay wife the sum of $20,000.00 per year. However, two (2) years after the divorce the wife becomes disabled or is legitimately unable to obtain full time employment such that her yearly earnings are reduced to $20,000.00 in income per year. At the same time, perhaps husband’s earnings have gone up as well. In this simple example, the wife may have the right to seek an increase in support due to her changed circumstances. It works in reverse as well, if the husband’s earnings or ability to earn is (legitimately) reduced due to changed circumstances, he may have the right to seek a reduction in his alimony obligation. It gets a little complicated depending on how the Marital Settlement Agreement (MSA) is structured as well. The above also would apply to changed circumstances regarding child support. An ex-spouse’s alimony obligation may also be modified or terminated if the supported spouse is cohabiting with another. Whether or not cohabitation exits is a very fact sensitive determination. Essentially cohabitation is defined as a relationship between two persons that are akin to a marriage. It is more than just dating, and or sharing of a residence together. Since alimony is based upon an ex-spouse being financially dependent upon the other ex-spouse, simply living together may or may not be considered cohabitation under our law. The cases that have come down through our Courts over the years, have stated what might be cohabitation, which include such things as the parties holding themselves out to the public as if they were married, living together, sharing of finances and living expenses, household chores, and subsidizing of one party by the other. For example, assume the new couple is in a long term committed relationship, they have joint bank accounts, perhaps joint investments, life insurance on each other’s lives and live together sharing expenses, go on vacation together, attend family and social functions together and the like. This type of relationship has the hallmarks and character of being a family unit akin to a marriage and thus cohabitation. This would give rise to the right of the (ex) paying spouse to seek modification or elimination of his or her alimony obligation. One of the original and seminal cases where our Supreme Court dealt with cohabitation was Gayet v Gayet published in 1983. (I had the opportunity to work on the case while at the law firm I worked at as a young attorney.) Since Gayet, several other cases have come down grappling with the issue of what is “cohabitation”. I say “grappling” because the Courts have to balance not interfering with the rights of an ex-spouse to seek and maintain a personal relationship with a significant other, as against the burden and fairness of the (ex) paying spouse continuing to pay alimony. 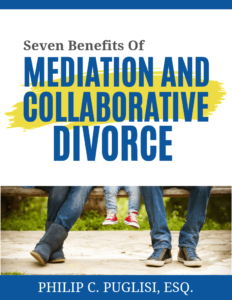 It is wise to try to deal with cohabitation in the matrimonial settlement agreement if possible, as to eliminate as much as possible concerns about it in the future. I would suggest that if you feel you ex-spouse is cohabiting with another, or if your economic circumstances have changed, whether you are receiving or paying support, you contact The Law Offices of Philip C. Puglisi immediately to discuss your rights and obligations.